Vilanova y le Geltru is a place where you can do many things, but when you’re with the family some things are an absolute necessity; for instance… eating! Hungry kids will always remind you of that, so when they’re ravenous during your Vilanova y le Geltru exploration, it helps to know how to keep the whole family satiated. We wish you a wonderful stay in our family hotel in Vilanova y la Geltrú! The Xató de Vilanova is actually the main dish of Carnival, which happens every 27th November. The dish itself has a fair bit of history behind it. Made from rather salty ingredients like tuna, anchovy and salt cod, it has traditionally been served up with olives and salad leaves, and is endowed with the delicious sauce of Arabic origins. Historically, such ingredients were put together as they were what was accessible to the local farming community. It was rare that you would find Xató de Vilanova being consumed without wine, so why break the habit of a lifetime? While you’re in Vilanova y le Geltru, do as the Vilanovans do! The wine consumption was always ceremonial in nature, consisting of tapping the barrel and fitting it with a tap to pour the wine; what this meant was that the carnival was about to begin. It also meant that it was time for the Xató de Vilanova to be served. The link to the wine taps becomes clear when you consider that Xató comes from the word ‘aixeta’, which means… tap! If the dish sounds interesting to you, feel free to take your family for a bite to eat at El Rossegal. 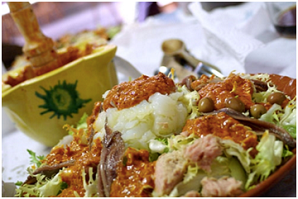 Even if Xató de Vilanova is not your thing, there are many other dishes to choose from. Alibaba Cuina Libanisa… the rather exotic name implies an exotic menu, and rightly so. Lebanese food is notoriously tasty, but you don’t need to be in Lebanon to confirm this. Besides, restaurant-goers rate this place very highly. Try out the traditional sweet mint teas (or a jug of juicy sangria!) 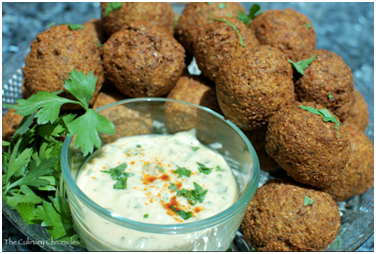 with your falafels, seafood, tajines or couscous creations. You can find Alibaba Cuina Libanisa at Plaça de les Neus, 6, 08800 Villanueva y Geltrú, and don’t forget to call to book on +34 632 96 37 81. Last but not least, and lest the kids let you forget, you might want to pop into one of the three Heladarias by Gelats Llorens; ice cream delights to keep them sweet all day long. We hope you have a delicious family stay in Vilanova y la Geltru!